The first autumn rains have refreshed the land after the torrid heat of Italy's dryest summer in 50 years - addio estate! And now crystal autumn skies, shorter days, and the faint smell of wood-smoke in the air hint at the many delights of the coming autumn. It's time to begin cutting and stacking logs for the fire, and time for the Marche Voyager newsletter autumn issue. Cheese-making in Le Marche is going from strength to strength and one of the artisan dairies leading the way is Trionfi Onorati at Jesi. Their Piandelmedico caseificio uses milk from the region's only herd of buffalo to produce a wide variety of hand-made cheeses from mozzarella and ricotta to a range of matured cheeses, including a blue cheese. You can find their buffalo-milk cheeses at speciality shops across the region as well as at their own shop, open daily, in via Piandelmedico outside Jesi just off the main SS76 road heading west. A festival dedicated to bread and bread-making takes over the streets of the seaside town of Senigallia at the end of September. Pane Nostrum runs for four days from 20 September, and includes stalls selling artisan breads from across Italy, demonstrations of bread making, tastings and even a workshop on gluten intollerance. Admission is free. Alongside the usual truffle festivals in October and November, other festivals featuring food and wine include Italy's oldest sagra dell'uva dedicated to the grape harvest at Cupramontana in the heart of Verdicchio wine country from 5-7 October, and the olive oil festival at Cartoceto from 4-11 November. 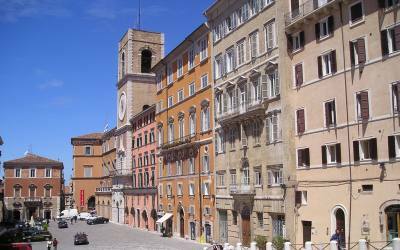 This month's image of one of the region's piazze, or town squares, features the prettiest of Ancona's four main piazze, Piazza del Plebiscito, commonly known as Piazza del Papa after the resplendent, if cracked, statue of Pope Clement XII that dominates one end. Juan Diego Flórez, one of the world's finest tenors, is set to take part next year in Rossini's marathon (and last) opera Guillaume Tell as part of the Rossini Opera Festival in August at Pesaro. The recent restoration of the Recanati Polyptych, one of Lorenzo Lotto's most impressive works, provides a good excuse for a visit to the museo civico at Recanati housed in the Villa Colloredo Mels on the edge of town. 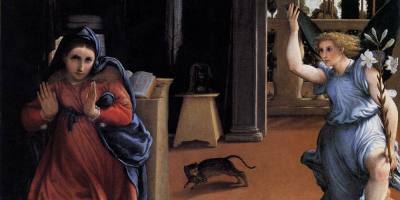 Alongside the altarpiece painted in 1506-08, are three other Lotto paintings including his lively Annunciation featured below. Villa Colloredo Mels museum website (in Italian). Polydore Vergil (or Virgil), the renaissance Italian historian hired by England's King Henry VIII to chronicle his family, was born in the northern Marche town of Urbino in around 1470.